Enjoy a leisurely start to your morning before being picked up from your Darwin hotel for your tour from Darwin to the Wildman Luxury Kakadu Lodge. Tour through Palmerston, cross the mighty Adelaide River, and into Mary River National Park to the Wildman Wilderness Lodge in the Mary River wetlands, your home for the next three nights. Tour from Darwin to Wildman Wilderness Lodge, Dinner, Overnight Wildman Wilderness Lodge Accommodation. Located 240 kilometres east of Darwin, Kakadu National Park is Australia’s largest National Park spanning a massive 20000 square kilometres! It encompasses wetlands, rivers, and huge sandstone escarpments. 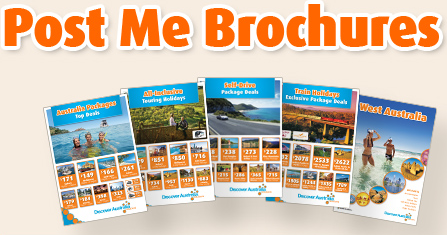 Enjoy an early pick up this morning and travel along the Arnhem Highway to world famous Kakadu National Park. Stop by the South Alligator River on your way to Ubirr Rock, one of the most famous sites of this World Heritage National Park. Ubirr Rock is famous for it’s rock art and get take in the three main galleries of art that are accessible to visitors. Climb to the top of the Rock to take in magnificent panoramic views of the surrounding floodplains and escarpments. After lunch by East Alligator River, walk to Cahills Crossing to spot crocodiles. Later, visit the Mamukala observation platform for stunning views of the surrounding wetlands and experience the incredible variety of the National Park’s birdlife. Return to Wildman Wilderness Lodge later this afternoon and enjoy the rest of the day at your own leisure. Breakfast, Full Day Kakadu Luxury 4WD Tour with Hotel Pick Up, Picnic Lunch, Dinner, Overnight Wildman Wilderness Lodge Accommodation. Today spend the day exploring the Wildman Wilderness Lodge. Take a 1 hour cruise along cruise along the Home Billabong this morning. Take in the ever changing ecosystem with your experienced guide who will give you an insight into the flora and fauna of the region. Later enjoy an optional airboat safari across the wetlands or just make use of lodge’s facilities. Breakfast, Home Billabong Cruise, Dinner, Overnight Wildman Wilderness Lodge Accommodation. After breakfast, get picked up from Wildman Wilderness Lodge and get transferred to Darwin Airport for your flight home. Breakfast, Transfer to Darwin Airport. 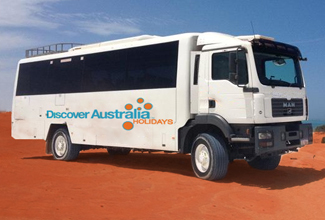 You will be personally met by a DISCOVER AUSTRALIA representative and transferred from the airport to the railway station, from the railway station on arrival in Darwin to your hotel. You will also be transferred to the Wildman Wilderness Lodge and from the Lodge to Darwin airport for your flight home. 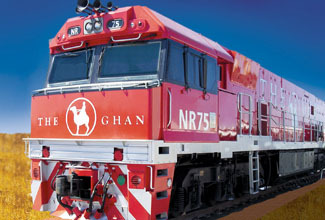 The Ghan with Darwin, Kakadu & Wildman Stay is very popular. Many dates book out well in advance, please book soon.